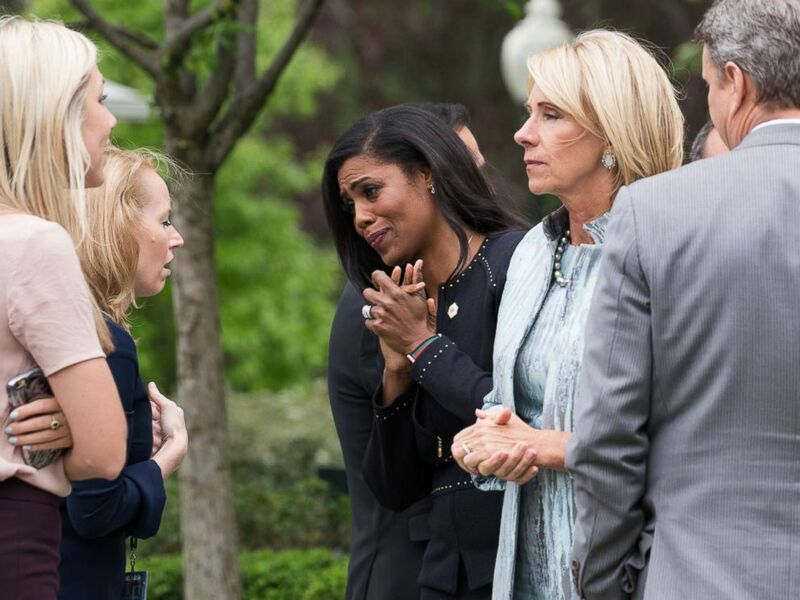 Two days after submitting her resignation as a senior adviser to President Donald Trump, Omarosa Manigault Newman acknowledged a “lack of diversity” in the White House that she said often left her feeling alone. “It has been very, very challenging being the only African-American woman in the senior staff,” she told ABC News’ “Nightline” today. Her departure will leave the senior staff of Trump’s White House with no African-American representation, she noted. 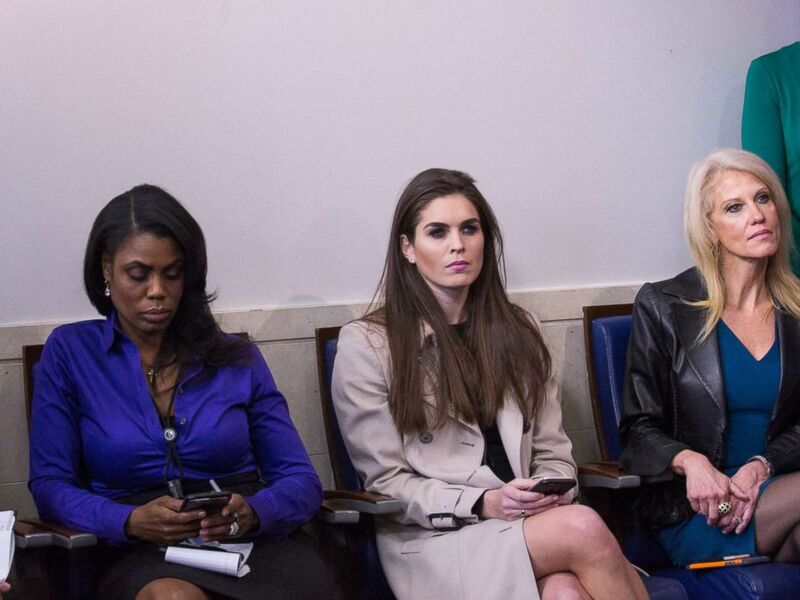 Omarosa Manigault, Hope Hicks and Kellyanne Conway attend a daily press briefing in the James Brady Press Briefing Room at the White House, Jan. 24, 2017 in Washington. “I regret that we haven't reached the level of diversity in this administration that I strove to see,” she said. In response to Manigault Newman’s comments, White House Press Secretary Sarah Sanders today sought to defend the level of diversity within the West Wing, even though she couldn’t say how many African-American senior staffers are employed there. The White House did not immediately respond to ABC News' request for specific numbers. Manigault Newman had been bothered by the president's highly controversial reaction to the white nationalist rally in Charlottesville, Virginia, in August that left one counterprotester dead, according to a source with knowledge of her thinking. Omarosa Manigault speaks to attendees at President Trump's press conference with members of the GOP on the passage of legislation to roll back the Affordable Care Act in the Rose Garden of the White House, May 4, 2017. Manigault Newman, 43, defended Trump today, however, arguing “he is not a racist” though he may find himself in disputes with people of color. Manigault Newman, whose ties to Trump began in 2003 when she was a contestant on his reality-TV show “The Apprentice,” said she’s still leaving on good terms with her boss. Trump had found out about her departure from watching the news, she said. 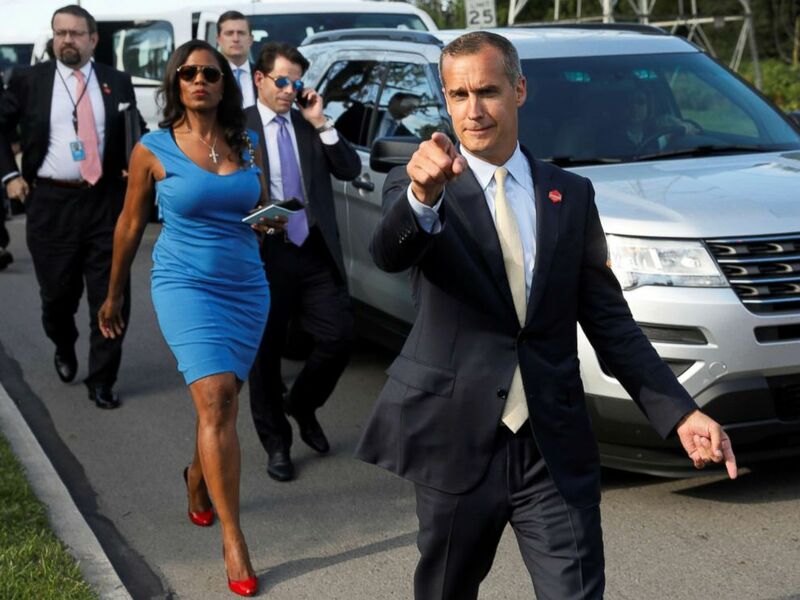 Omarosa Manigault walks to an event for veterans in Struthers, Ohio with Corey Lewandowski, Sebastian Gorka and Anthony Scaramucci, July 25, 2017. ABC News' Jordyn Phelps and Alex Mallin contributed to this report.